I'm not sure this resembles what you're talking about, but I do have a recipe from the 70's early 80's for pizza burgers using hambuger, spaghetti sauce, etc. that is served on an open-face hamburger bun. Don't laugh when you see it but it's actually quite tasty and it freezes very well. Brown the hamburger & drain. Grind Spam in a blender or use a grater. Mix the meats w/ the remaining ingredients. Combine well. Spread on each half of the burger buns and bake 12 minutes @425. If I'm lyin' I'm dyin' -- it's a pretty good fast meal and I'm sure it's right out of the 60's, right? Try ground up pepperoni mixed with tomato sauce (dash of garlic, salt, pepper and onion wont hurt either - Food Processor works great for this). Top the burger or mix it in before cooking. (I know you said no tomato base, but everything in the 70's related to pizza had it). Found this quote that may help you. Someone talking about a pizza burger franchise from the 1950's, 60's. "The Pizza Burger was a Trade Mark and franchise I had to buy and obey all the rules that went with it. We had a special bunch of herbs and spices that came in a packet. We had to put some of that in with ground pork patties and mix some with the Pizza Sauce. We grilled the pork patty then spread some sauce on that, then chopped onion then a sprinkle of Parmesan cheese topped with a small square of American cheese and covered till melted. Then served on a bun." My mother use to buy frozen patties back in the 60's called pizza burgers. I think they were a pork pattie with a mozarella cheese filling, and a hint of sauce. I am also looking for the "authentic" Pizza Burger recipe from my catholic school in the 60's. It was not actually a "burger" at all, that is, not a patty. It was a soft emulsified kind of mixture. I suspect that SPAM was a part of it. I remember them being orangish in color so maybe an American or Cheddar cheese layed or sprinkled on top. I have found numerous recipes and have narrowed it down but I am still searching for the EXACT recipe. timlahr, Check out post #2. It has SPAM in it. I'm late to this thread, but back in the late 70s my sister worked at a local Tastee Freez sandwich/ice cream shop that served a pizza burger. It was a highly seasoned breaded meat patty with a slice of mozzarella in the middle. This was deep fried and served on a bun with marinara sauce. If anyone knows where to get these now, I'd love to try them again. Prepare grill or heat a cast iron grill pan on the stove over medium heat. Combine ground beef, salt and pepper. Form into 6 patties, being careful not to overwork the meat. Grill burgers 4-5 minutes. Flip. Top each burger with 2-3 slices pepperoni and a slice of cheese. Grill to desired doneness, another 3-8 minutes until the internal temperature reaches 160 degrees F .
Place burgers on buns. Squirt with ketchup. Serve immediately. Serve these pizza burgers with mustard potato salad and Ramen noodle coleslaw. Is there a brand name? Most of the Milwaukee area Pick n' Save stores sell them.... I have bought them there many times. They come in a box of 6 or 8. I can't think of the manufacturer and it is driving me nuts. !! Thanks! Hopefully they are in some grocery store in the Atlanta area!! Here at the Copps (Roundy's) they have Supreme Meats brand...in red and green box...hope that helps. The pizza burger we get here in the Midwest is a seasoned breaded meat patty with a slice of mozzarella. The brand is Fred's. I believe on the box they also call them a beef patty. Yes! Its the Supreme Meats brand, Kevin. Thanks Wintahaba!Been around for years. Thanks, wintahaba and Ann!! I'm guessing they might be a bit hard to find in the ATL but I'll try! We have a chain of grocery stores called Ingle's that has a lot of things you won't find elsewhere, it's where I get my Slawsa fix as well as spiedie sauce!! My husband's aunt and cousin work in a school cafeteria here in PA and they use Bologna instead of Spam. And Yellow American Cheese instead of Mozzarella. Yummy!!! Yes, Kevin, those are it!!! Maybe there would be some older drive-ins or diners that you might get lucky at. Here's an example in Winona MN, which is the same town that has a write-up in the Roadfood Restaurant column, Bloedow's Bakery. Scroll down to Specialty Sandwiches. They say it's the original! They also have something else I've never seen anywhere. They call it a "shrimp patti", and it is actual cut up pieces of shrimp packed together with some kind of binder into a patty and deep fried. Different than on the east coast, where the shrimp is in individual pieces. This is all in one piece, like some fast food deep fried fish sandwich. It's actually not bad. Expensive for what you get. But the place has been around since 1938, so good or bad, they're Roadfood! Hey, I hit the Daily Double! And I meant to mention they follow the upper Midwest tradition of calling a sloppy joe a barbecue, BBQ. Of course it's not the real stuff, but that's how we roll. Some places, back to the fifties, still call it a Spanish burger. And they do have the walnut burger, a local thing that originated in the beautiful little river town of Trempealeau, halfway between Winona and La Crosse. At the original inventor, the Trempealeau Hotel, they offer either the burger or an appetizer of Walnut Balls. I prefer the balls, as you get more crust, which to me makes all the difference. Could what some of you are describing from the 50's and 60's been a prepared and frozen beef or pork parmesean patty as the base? Those use to be pretty popular back then. My dad was in the marine maintainance business during that same period and he used to handle meats and provisions on the side. He'd bring home boxes of these frozen patties that were supposed be baked in an oven. The meat didn't cook up firm, but sort of mushy with an orangeish color from the breading depending how long they were baked. They definitely had some sort of italian seasoning to them. I wasn't crazy about these and used to get them between two pieces of bread like a burger, but it sure didn't have the texture of one. If these were done on a sheet or H&R pan in an oven and topped with a prepared pizza sauce and cheese and put out on a steam table to be served on a bun like an open face sandwich, this would sound near identical to what some of you are describing for that period of time. The only product I ever remember actually being called a "pizza burger" were those infrared oven cooked sandwiches in the plastic bags by Stewart and Landshire sold in gas stations, dept. store concessions, and convenience stores before microwave ovens were around. They were the same mystery meat rubberburgers as the regular hamburgers or cheeseburgers except they had some seasoned, red sauce on the patty. If there was any cheese on those, I don't recall it. This is a VERY old post, but I was looking for the pizza burgers of my youth, wondering even how to make one from scratch and found this. I worked at an A&W root beer stand in NW Wisconsin not far from the Twin Cities of Minnesota, in the mid 1970s. We served a pizza burger that was a frozen patty with weird grid marks on it (probably to facilitate quick cooking) - it was probably pork, because the texture was "sausage-like", was definitely seasoned with Italian flavors, and had a white cheese like substance sandwiched in the middle. When griddled, it would brown up nicely and the cheese in the middle would become molten, and quite dangerous to your chin and tongue. It was served topped with a little "pizza sauce" or marinara on a toasted bun. Later, I could find the patties frozen in local grocery stores - they were stacked in a white plastic bag which had red and green lettering on it, tied with a plastic clip. They were probably crap, but I loved them, and still cherish the taste memory. Definitely different from the "Supreme" brand patties I see advertised now on the internet - the cheese was white, not orange. The original poster was looking for the open faced sandwiches that were pizza flavored, served in schools - I'm guessing the spam and ground beef recipe is the correct one - that recipe made the rounds among all the mom's in my town in the 60's - except I seem to recall it called for tomato soup (aaaacccchhhh) instead of jarred sauce. I never laid eyes on a jar of spaghetti sauce until after I left high school in 1974. Yes. It's a form of the Juicy Lucy in that it had/has yellow cheese inside the patty. Our high school cafeteria used bologna as part of the meat source to keep the cost down. 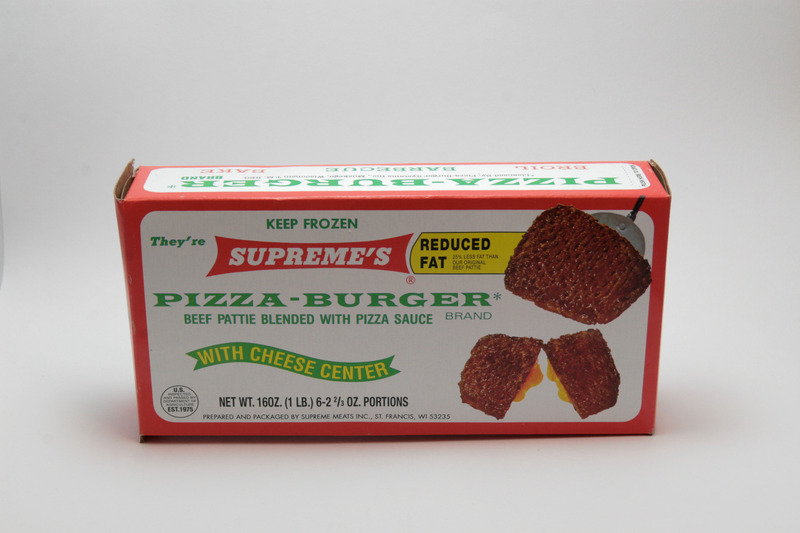 We tried the Supreme Meats pizza burger that is pictured above, as we had pretty good memories of them from our youth. Yuck. Either our tastes have changed( more than likely) or the burgers have changed.